La Bonne Crepe |Authentic Crepes | A Bristol based creperie serving delicious authentic crepes and galettes with a smile. La Bonne Crepe is a traditional, artisanal creperie based in Bristol. We make authentic and tasty crepes with a smile and share a good time with our customers. Established in 2007, La Bonne Crepe is a popular fixture for small and local events, Christmas Markets to large festivals such as Glastonbury & The Secret Garden Party. We have also created several pop-up creperies in different pubs around Bristol. We are also a founding member of Bristol Eats, an award winning street food collective promoting healthy, quality, local street food from around the world at reasonable cost in Bristol. Our batter is freshly made to order and in front of the customer. We make the batter ourselves, from scratch, and with love! All our fillings are specially chosen for their quality and assembled following traditional recipes. Our bananas, sugar and chocolate are Fair-trade. Our chocolate sauce is gluten-free. Our eggs are Free Range and laid by happy chickens. Our vegetables, ham, cheese are sourced locally. We avoid products containing E numbers and artificial colorants. We try to avoid big brands. We are now able to offer a full vegetarian and Vegan menu if required. All our food packaging is biodegradable and eco-friendly and most of our waste is recycled. We use eco-friendly cleaning products recognised by Environmental Health Officer. We have a proven track of trading at events where sustainability is essential. We keep improving our processes to limit our impact on the environment and increase our ethical credit. In addition to the crepes, we also serve Fair-Trade tea and hot chocolate, Fair-Trade and Organic coffee from Sumatra, latte and cappuccino, and cold drinks. La Bonne crepe is available for private and corporate events. La Bonne Crepe is the perfect addition to a successful event offering a popular, original and unique product. 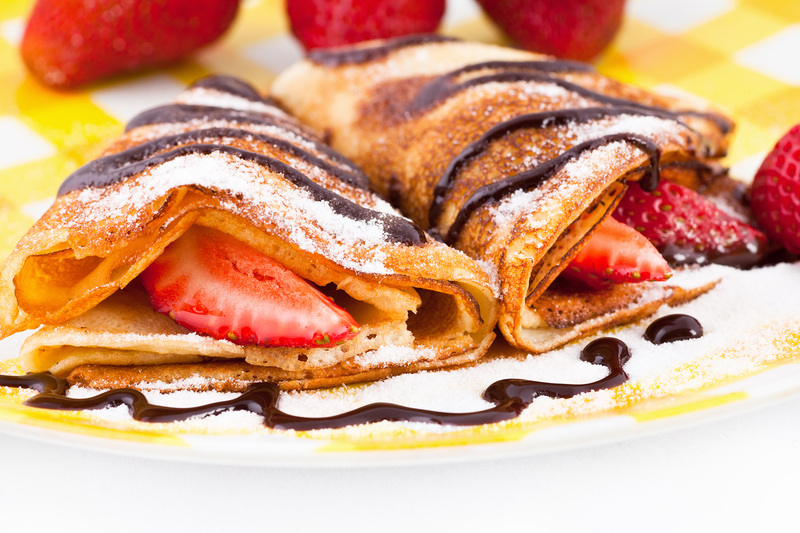 Your guests will be entertained: people love to watch crepes being made. We offer an authentic taste of crepes and galettes. We offer good value for money and provide 2 or 3 hours of live cooking. We can serve you indoor or outdoor with professional crepiers. We are fully insured and work on safe and certified professional equipment. Please contact us using the form below to discuss your requirements. La Bonne Crepe is the perfect for weddings. We offer something different for your special day and we can cater for the evening food or the wedding breakfast. We usually offer 3 hours of live cooking with people being served as many time as they like. We usually require a minimum of 80 guests but we will consider less if it is in Bristol area. La classique: egg, Cheddar, Ham. Many thanks to La Bonne Crepe who was at Shambala Festival 2016 ! I was afraid of not being able to eat meat or fish but their ingredients were so good and fresh that I loved. And more, I found the French and the pancakes and crepes of my native Brittany. We just wanted to say a huge thanks to you all for cooking for us on our wedding day. You were all so friendly and helpful and the crepes were absolutely gorgeous! So many guests commented on how fantastic you were. Thanks again and we hope to have crepes in the market again! Just wanted to say thank you once again for last night - the crew were delighted with your crepes and your friendly service, thank you. Thanks Christophe, everyone was singing your praises and loved your crepes and galettes!! Thanks for coming that way. Hope to visit you one day in Bristol!